A town that developed on the outskirts of the Demon Ruins/Lost Izalith whose inhabitants became infected by the Blight Pus. It is likely that many of the people here became servants of Quelaag and her fair sister. The mining aspect is further supported by the platforms that hug stone walls, tunnels dug into the side of the cliff. Some Infested Barbarians drop pickaxes, and the slugs drop Titanite. Sitting just outside the entrance to Blighttown is Domhnall of Zena. Once having reached the bottom, the Undead is invaded by Maneater Mildred. Somewhere in this swampy area Quelaana of Izalith wanders. At the base of Blighttown, the Undead faces the arachnoid Chaos Witch Quelaag and thereafter awaits the second Bell of Awakening. Once both bells are rung, the gate to Sen's Fortress opens. Below the bell is a secret hallway where Eingyi, a former pyromancer resides, watching over the Fair Lady. 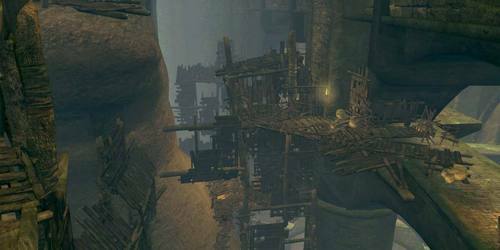 Miyazaki: Everything had its particular shade or tone; Blighttown, for example is the rawest, most disgusting area in the game, but looking at the area as a whole, I wanted it to both possess a deep sadness and feel bitterly cold, that's the atmosphere I tried to build on. Miyazaki: As for Blighttown, I started with a number of images that I wanted to incorporate, but due to the complexity of the area, it would have been difficult to try and design all at once, so instead we began with large features like the water wheel elevator and, with the designers and artists, gradually built the area up from there. 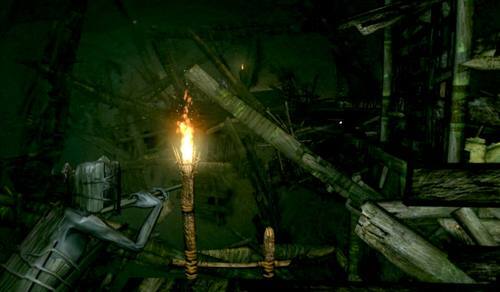 Miyazaki: The Catacombs and the Tomb of the Giants have a similar atmosphere to that of Blighttown but both contain a great many more man-made objects, which meant more work for the artists. In our team, the 3D artists would sometimes be called upon to do work more akin to that of a traditional artist, because we tried to utilise their skills as much as we possible. As I said before we don't have many artists to work with and just throwing more people at something doesn't guarantee a better result.